I recently ran across this Question and Answer Forum on the internet. How do Monasteries Survive Financially? At St. Simeon Skete, Nazareth House Apostolate, we survive by God as He expresses Himself through the love and generosity of those who give to support the skete and its outreach in Sierra Leone. It is important that you know that prayer is continual at St. Simeon Skete. You are prayed for daily - taken up in Jesus’ Name. As the world spirals downward, it seeks to prevent believers from recognizing the significance of Christian Sketes, Monasteries and Convents as vitally important centers of ongoing prayer that replenish what is drained in the busyness of a hectic world. At the Skete we are here praying for you as you are in the world and for you when you are unable to pray. When you are driving down that busy street trying to get to work, already late because the dog got out as you were leaving and you had to chase him 2 blocks - its good to know that somewhere there is prayer going on and you are taken up into that prayer. Life at the skete is not different from what all Christians are expected to be doing - prayer, work and study. Rather it is a more intensive form of the life in Christ, the life that we are all called to live. What are some distinct ways in which St. Simeon Skete has an impact on the faithful? First and foremost there is the ongoing prayer. The world needs prayer and it needs it in a big way. Many are looking for spiritual guidance - a way to come apart from the world in order to be fed and replenished and then to return to life in the marketplace with the tools to maintain and deepen their spiritual life. At the skete the faithful can seek and receive guidance and a balanced approach to the challenge of living the Life of Christ in the world. It is like a reset button, giving us the tools to go back into the world taking with us what is needed to strengthen ourselves. Those that come here will tell you, it's not easy here but if you embrace the skete as it is intended, you will be changed. We have a vow of hospitality, therefore we do not charge for lodging at the skete. We have, however, had to require visitors to purchase their own food for breakfast and lunch during their stay. Evening Dinner is provided by the skete as a community meal. The Scheduled Prayer at the Skete is a days work in itself. However, for us the day also holds maintenance of the property (34 acres), the upkeep of the buildings and Wailing Wall, administrative work of both the skete and the overseas missions (including running a school of 300 students), growing our own food, hospitality and guidance of the guests, communication (Nazareth House Apostolate is a family and therefore we keep in touch with our supporters) - all in a days work at St. Simeon Skete. Many monasteries have staff that help with the temporal chores of the day, we do not. We are not funded or supported by the church at large or by large donations. Rather we are supported by individuals, families, small organizations, a few individual churches of all denominations and an employee matching giving system. Most of those who give make a great sacrifice to do so. The prayer schedule must be maintained. In Revelation 5:8 it says “And when he had taken the book, the four beasts and four and twenty elders fell down before the Lamb, having every one of them harps, and golden vials full of odours, which are the prayers of saints.” and then in Revelation 8:3,4 “it says Another angel, who had a golden censer, came and stood at the altar. He was given much incense to offer, with the prayers of all God’s people, on the golden altar in front of the throne. 4 The smoke of the incense, together with the prayers of God’s people, went up before God from the angel’s hand”. At this level, God doesn’t act apart from prayer. The importance of it is obvious. God is waiting for us to pray. Many of you have heard Seraphim and I describe the scenario of angels at the edge of heaven, peering down looking, waiting for our prayers to rise as incense. They shout down “more prayers, more prayers” and as they receive the sweet smelling incense of prayer they gather it as offering to God. People like to “do good”, they like an outward showing of their generosity. Sometimes the needs of the skete are overlooked by the demands of the humanitarian work in Sierra Leone. Without the life of prayer at St. Simeon Skete there would be no accomplishment of the amazing work via NHA in Africa. Nazareth House Apostolate has an excellent well rounded Board of Directors living in all areas of the country. We have a small staff in Africa, namely James and the teachers. In Taylorsville, on the ground at the skete, it is just the two of us. Guests give physical help when and where they can but the responsibility of it all is on Seraphim and I. The proper thing to do is to arise in the middle of the night and pray. For many years now we have been doing this. Up until recently we were arising at 2 AM for prayer rope vigils and the daily Mass was celebrated at 3 AM. The physical responsibility of the skete has become such that we are no longer able to maintain that schedule, the prayer continues but we’ve had to change the time frame in order to allow our bodies the much needed refreshment and sleep. Wednesdays there is a discussion class at 11 AM and the 11 AM 3rd Strand of the Prayer Rope, Remnant Rosary scheduled at that time is adjusted into another time of the day. Fridays the schedule is different. At 11 AM, the 3rd Strand of the Prayer Rope, Remnant Rosary is said at the chapel and open to the public followed by Stations of the Cross proceeding up to the Crucifixion. 3 hours later at 3 PM we return to the Chapel to walk the remaining Stations of the Cross with the normal 2 PM Prayer Rope said following. In between the Prayer Schedule we are doing our daily chores and administrative work and instruction with visitors. Its a busy day. Because of a down payment by a generous friend and supporter, St. Simeon Skete recently acquired the Retablo of St. Isidore the Laborer/Farmer (aka St. Ysidora) (Feast Day May 15). 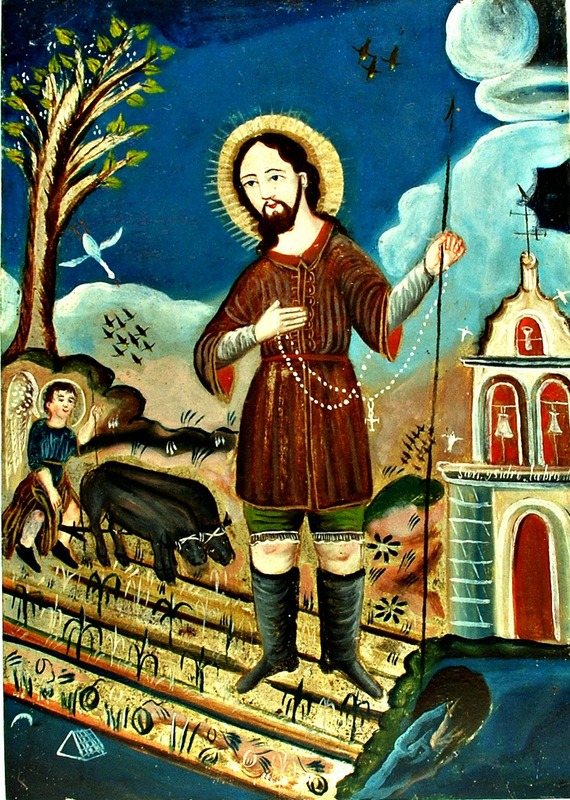 The importance of this retablo to the skete is that St. Isidore, the Farmer had much work and responsibilities demanded of him and he wanted to have more time to do his spiritual disciplines and he couldn’t do both. So he prayed and God sent angels to help with his work. Look carefully at the satisfied smile on the angel as he plows the Garden for St. Isidore. As did St. Isidore, we at the skete want to have more time to do our spiritual disciplines. To do this we need help. There are some things (repairs, construction, maintenance) that if we had the funding we could hire it done but for now we are doing it ourselves. It is important that the Skete be identified and known as a spiritual place. We want to build a grotto, fix up the Chapel at the Wailing Wall and bring the statue of Mary out of the garage and the purchase of three retablos with significance to the skete’s spirituality. But it takes money to do these things, and to continue to operate and maintain. And then there is the ministry extended in Africa. It was a struggle but thanks to your generosity, NHA was able to provide two uniforms for every student in our school. It took us until January, well into the school year, but it was accomplished and we are all most grateful. In order to get a bit of a head start on the next School Year we are in gear to collect the funding in hopes of providing the uniforms at the beginning of the 2014/2015 School year which opens in September 2014. The uniforms we provide benefit the students but it goes well beyond that. For a $25 donation a student receives two uniforms to wear during the entire school year. For many students it is the best clothing they have and they must laundry them in the stream and beat them on rocks to get them clean. This doesn’t serve well to make the uniform last. By year end, most uniforms are in tatters. At $25 a student times the 300 enrolled the cost of new uniforms is $7,500 but there is a triple-fold benefit in that expenditure. The marketers benefit from the purchase of the cloth. The seamstresses are able to have work that enables them to provide for their family. Its a win win situation. The enrolled of the NHA School has so increased that we have outgrown our current building. We simply must add on additional classrooms to provide proper education in a safe environment. The overcrowding in our classrooms is very uncomfortable. In order to accommodate the expanded needs of the school we hope to break ground for a new structure to our school this Summer. Our figures at this beginning stage is $50,000. We are waiting for a contractor to give us the official word on the cost now. The other Sierra Leone news is that Lucy Mansaray, James daughter has completed all high school education and will be enrolled and beginning medical school September 2014. Her school and books will be upwards of $5,000 annually but very much worth the investment. Having our own NHA Doctor is invaluable to the work of Nazareth House Outreach. We ask for your prayers and support in these matters. The purpose of this post is to clarify the work of Nazareth House Apostolate both at the skete and in Sierra Leone. We need your prayers, support and love. It is important that you share the work with others - spread the word, enlarging the support base so that the good work of this Apostolate may flourish.